Most creatures of the Mesozoic Era held the limelight for 10 or 20 million years before going extinct, which is why it's astonishing that various species of the prehistoric shark Hybodus persisted for close to 200 million years, all the way from the late Permian through the late Cretaceous periods. This small- to medium-sized shark possessed a couple of odd characteristics that may help to explain its success: for example, it had two types of teeth, sharp ones for ripping into fish or whales and flat ones for grinding mollusks, as well as a sharp blade jutting out from its dorsal fin, which helped to keep larger predators at bay. Hybodus was also sexually differentiated; males were equipped with "claspers" that helped them to hold on to females during the act of mating. 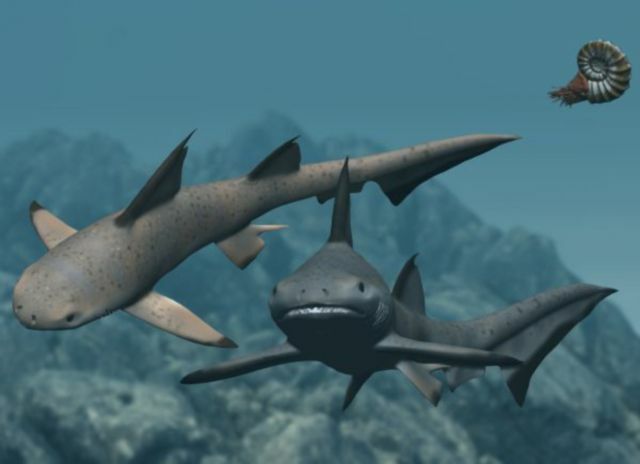 Most tellingly, though, Hybodus seems to have been more solidly built than other prehistoric sharks. Part of the reason why so many fossils of this genus have been discovered, around the world, is that the cartilage of Hybodus was relatively tough and calcified--almost, but not quite, like solid bone--which may have given it a valuable edge in the struggle for undersea survival. The persistence of Hybodus in the fossil record has made it a popular go-to shark in nature shows; for example, a Hybodus is shown preying on an Ophthalmosaurus on an episode of Walking with Dinosaurs, and a later episode of Sea Monsters depicts it digging into the giant prehistoric fish Leedsichthys (which is distracted from this pesky predation by its own life-and-death battle with a ravenous Metriorhynchus).